Glow in the dark plastic vampire fun fangs with candy balls. These are the perfect Halloween candy. Add them to your Halloween costume, use them for Halloween party favors or hand them out to the trick-or-treaters. The kids with love them. If you are looking for other fang treats; we also have wax fangs and gummy fangs. 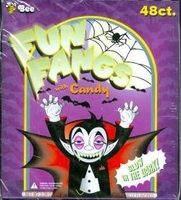 Each box of fun fangs has 48 individually wrapped glow in the dark fangs.